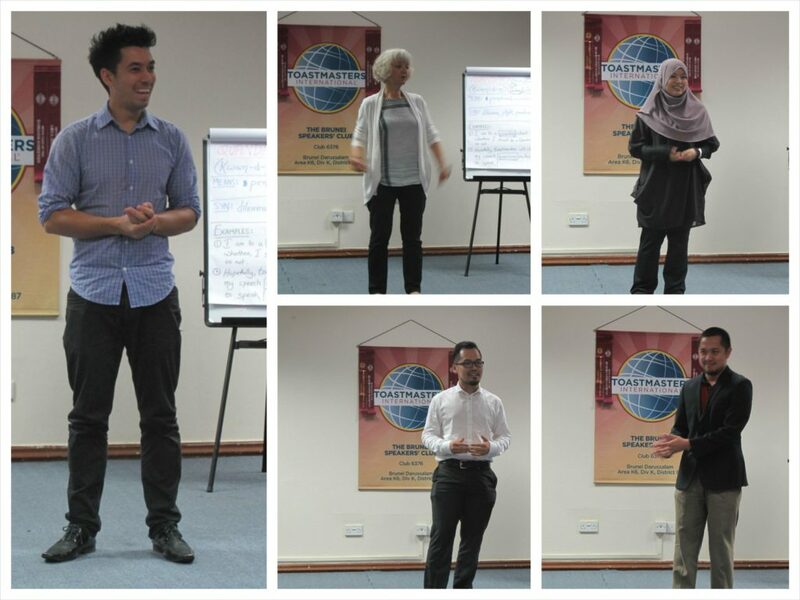 The meeting began with our Sergeant at Arms, TM Macalister Mac, welcoming our repeated guests Wafi and Mardy. 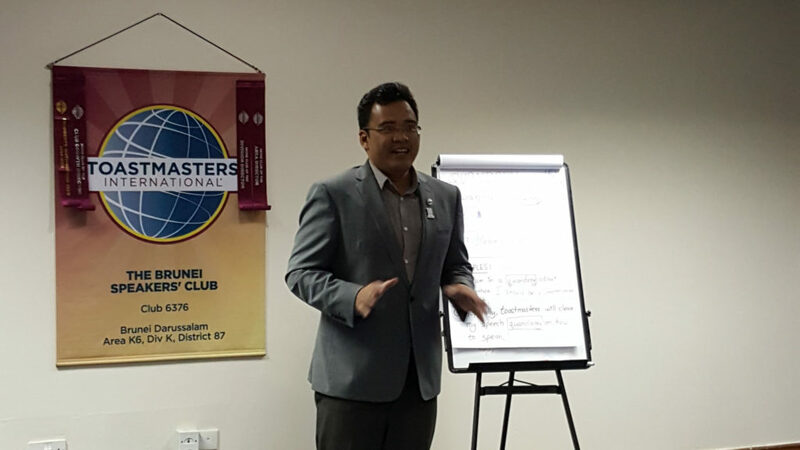 As Amran Jamaluddin, CC, took charge of the meeting as the Toastmaster of the Evening, he introduced his role players for the night. 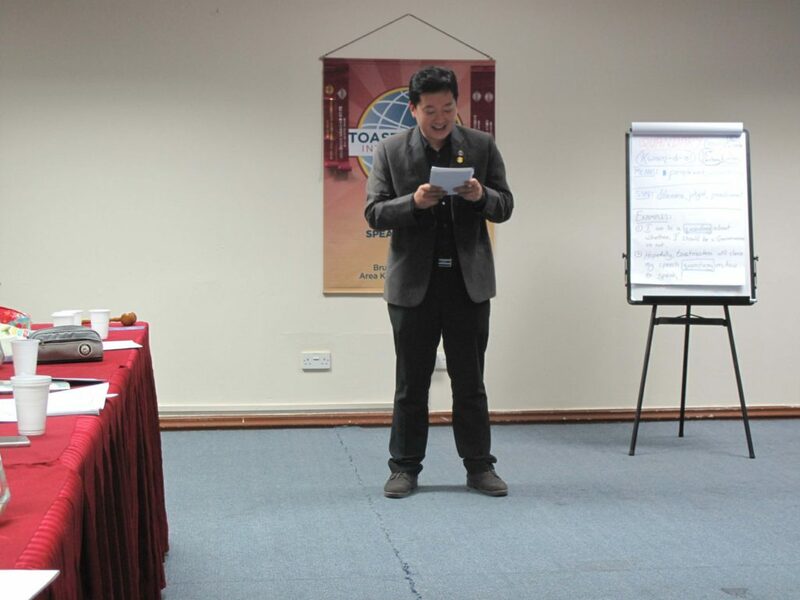 We had the Table Topics Master Jordan Yau, CL, with his all-time favourite theme: food. 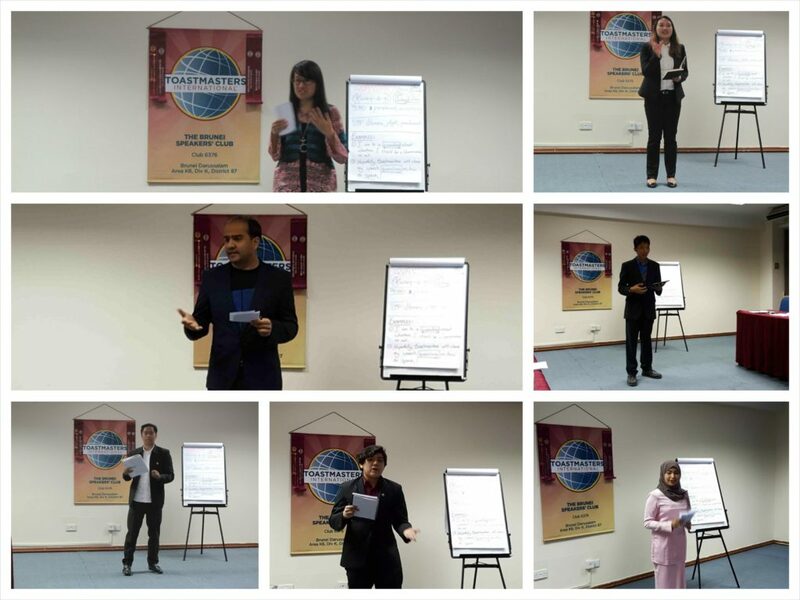 He was complemented by the ever so elegant Table Topics Evaluator TM Faiz Jailani, who explained that he will look into what the speakers do well and what they could improve upon. The next role, Grammarian, was manned by Rahul Breh, CC, who shared the word of the day ‘quandary’ – it means perplexed or uncertainty. Rahul, further explained the word quandary to be synonymous with dilemma, plight or predicament. An example that was used was: “I’m in a quandary, as to whether I should be a grammarian or not”. 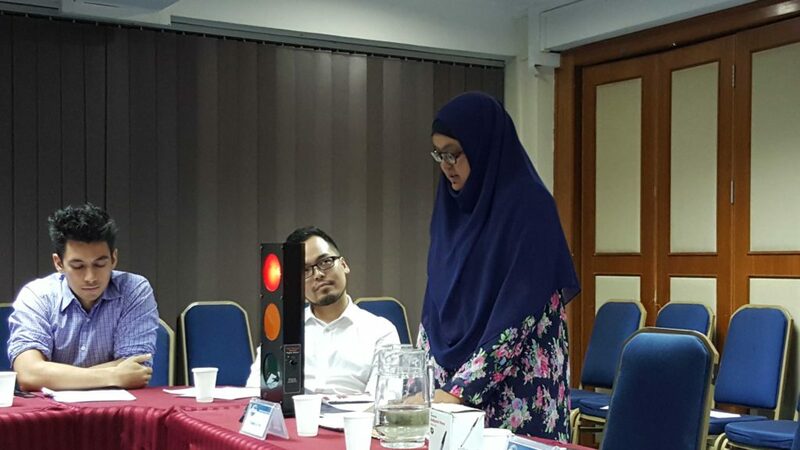 The Ah Counter & ‘Who Said What’ role was taken up by TM Syatrah Roslan, who would call out those who use filler words and crutch words during the meeting. TM Haryati Gafur took the Timer & Tip role, where she exerted consistency and commitment in perfecting the role. Lastly, we had the General Evaluator Hilman Omar, CC, who explained that he would provide a second opinion for the evaluations provided by the evaluators of the meeting. Before we moved on to the prepared speeches, Amran, CC, left us with his thought of the day: He recapped last week question in table table topics, whether we want to know what will happen to us in the future. Amran, CC, said, “Let it be.” Our future is determined by what we do today. We don’t need to know because what we do now will affect the future. 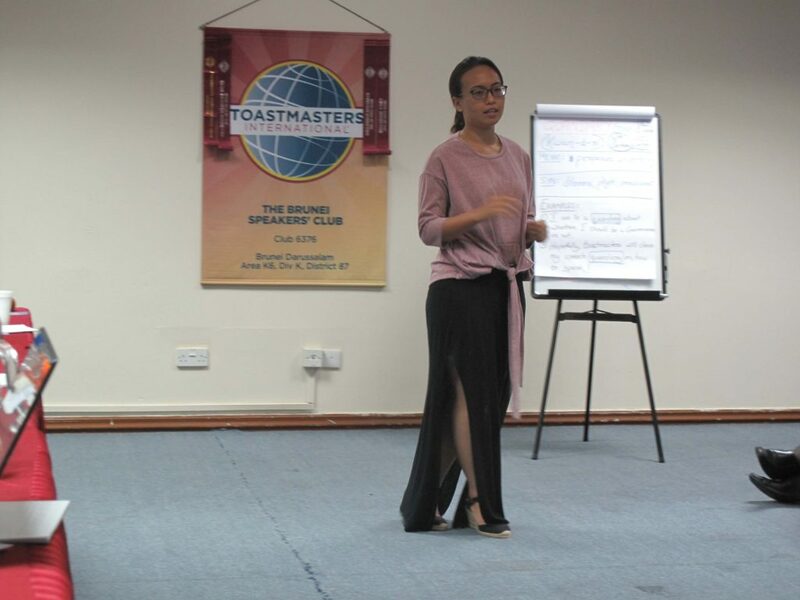 When TM Mei Ann turned 25 years old, she had some realisations and looked back into the first quarter of her life, and came up with three personal motto to guide her way of life for the future. 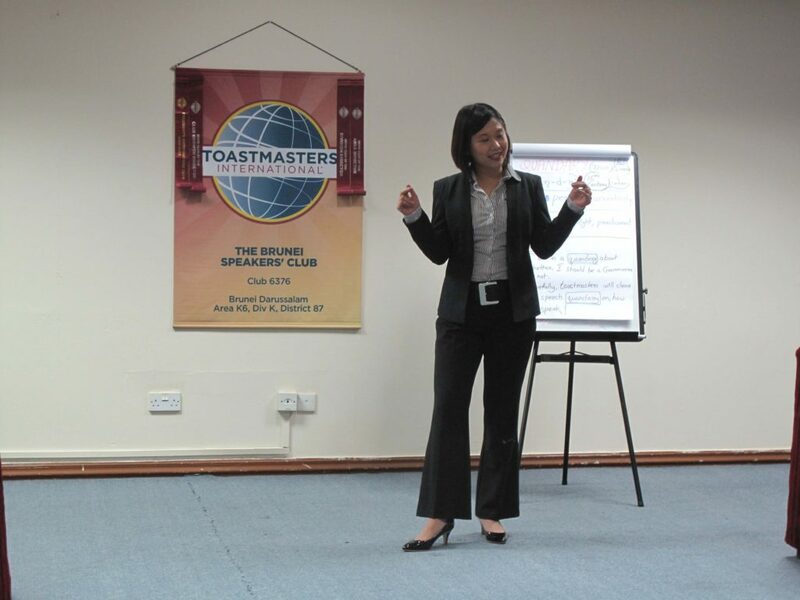 TM Mei Ann first motto is to communicate with intent. She felt that her networking and gatherings were fake. She was in a quandary. She began to feel helpless, lifeless and as if she had hit rock bottom. She then began cognitive restructuring. She now speaks and communicates with her inner self and brings out what she wants to express. The second component of her motto is to execute with grit. This realisation occured when she almost did not stand up for a friend. Her friend was feeling sick and all she needed to do was to simply knock on the door and tell people to keep quiet, as her friend needed to sleep. After a few moments, she gathered her resolve and finally did what she needed to do. Mei Ann’s third motto is to concentrate with effort. She found herself lacking in communicating her intentions. She reminded herself to continue developing her skills and she resolved to take action in the future. TM Adah Rani spoke about her adventure in Vietnam where she spent her two-week holiday. The highlight was her visit to Sa Pa, a landmark in the far North of the country. She met her friend from a tour agency, Su. TM Adah would describe the people there as very young looking, petite and having smooth, fair complexion with rosy cheeks. Even Su that was 28 years old looked like a man in his teenage years. Towards her journey, she had a mini-tour on the outskirts of Sa Pa. The silvery, sparkly waterfall, the cool refreshing breezy mist, emerald green paddy estate – all of these were the sceneries enjoyed by TM Adah. TM Adah concluded that to climb the mountains in Sa Pa, it is not for the world to look at you, but for you to look at the world. In 2014, Dalton was on the verge on getting an opportunity to visit and study in America. 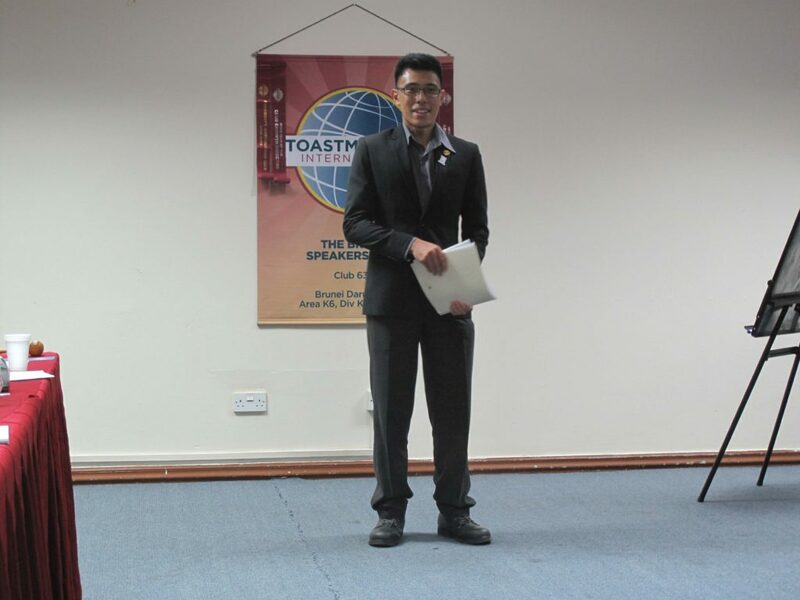 “If you want something out there, go for it.” Dalton was a student in Maktab Sains and on 26 june 2014 , he found on the top left of his table an envelope containing an offer letter., Dalton was awarded a partial scholarship to a university in America. Unfortunately in July 2015, his father got into an accident. His father couldn’t be the breadwinner of the family and therefore was not able to financially support his studies. Devastated, people may thought he was unlucky. However, he says he only use his family condition as an excuse. He could have done a part-time job and at the same time provided for himself at the university in the States if he wanted to. But he didn’t. He advised others not to repeat the same mistakes he did. DTM Genevieve Lai – ‘The pros of vegetarianism’. DTM Genevieve grew up eating mainly seafood, eggs, especially cheese. She does eat meat – however she became less and less of a beef eater over time. DTM Genevieve explains that she still feels great and energetic with the diet she is having. TM Awfa Nawawi – ‘What is the weirdest thing you’ve ever eaten?’ TM Awfa has travelled to various countries but none of the food she ate there were weird…except in Brunei. When TM Awfa was young, she didn’t know what she ate was shark fin. She did her research and found that it was illegal. That goes for her first experience eating turtle eggs too. 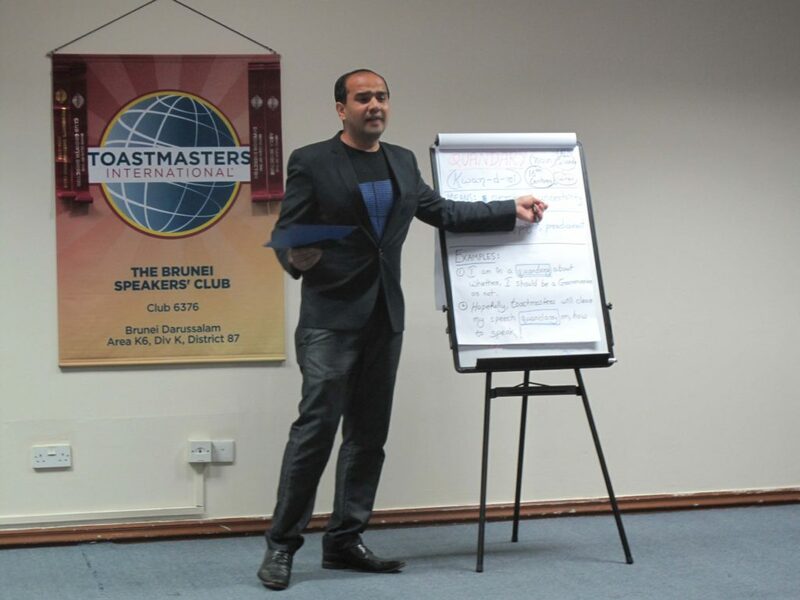 Guest Wafi – ‘The ideal meal course for his coming wedding’. Wafi began by telling us about his eating habits. He was very picky and selective when it came to food. He then changed when he studied abroad for three years. He can now eat anything that’s not moving. For his wedding meal, he will leave it up to the hotel’s caterers with the exception that the meal should not have six legs, and there must be cake! Guest Mardy – ‘The most expensive meal you’ve ever had’. Speaking from Mardy’s personal experience, the most expensive meal he ever had was the meals he catered for his wedding. The meals he provided were leaning towards what his mother and guests would like. TM Jidun Dollah – ‘The healthy meal before exercise’. Jidun stated that food that are source of protein as fish, energy bar, vegetables are recommended, and need to be taken 2 hours before the exercise. Avoid carbohydrates such as rice. 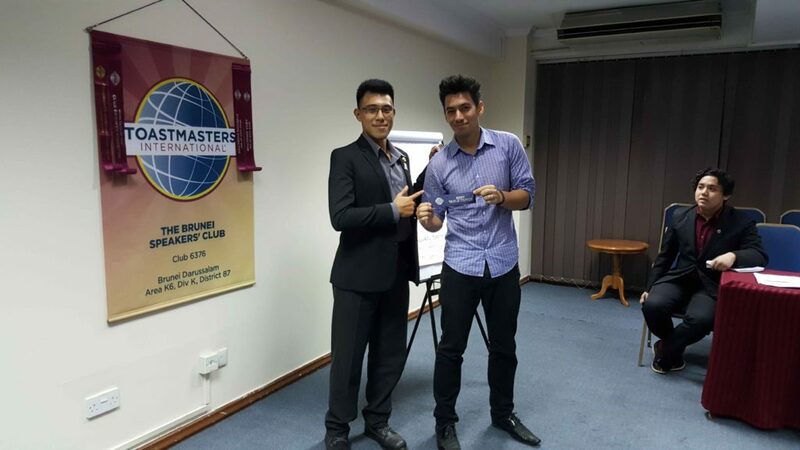 Best Table Topics speaker was Mardy. Double winner for Best Evaluator: Rahul Breh, CC and TM Rahmat Tarsat. 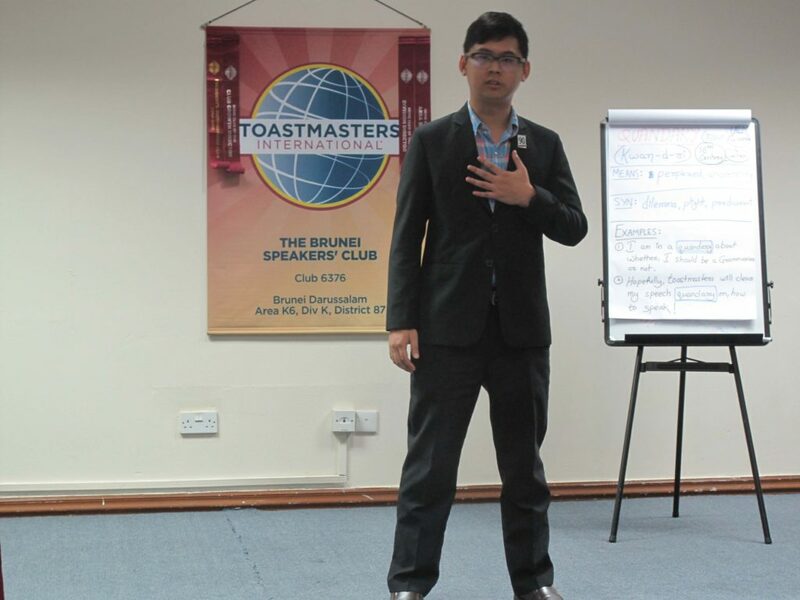 TM Macalister Mak gave his closing remark by explaining his learning journey in Brunei Speakers Club and he enjoys seeing other members grow as well.